Language Log » "Suffered We Protect They"
How can we explain the "Suffered We Protect They" that is on every poster? What must that have come from in Chinese, if indeed it did come from some Chinese on the posters or elsewhere? "When they suffer, we protect them"??? I have to say this is such a weird and confusing translation. I can only guess what idea it is trying to express. If I get the meaning right (which I am not quite sure), it is trying to refer to a famous slogan "苦了我一个，幸福千万家." The slogan is widely used to praise party members or soldiers who make sacrifices for the benefits of the people. Some variations of the slogan may be 牺牲小家，保卫/幸福大家, etc. In this case, I guess the poster is saying that the SWAT team are willing to risk their lives in dangerous situations in order to protect the safety of the Liuzhou people. But why does it need an English translation anyway? Liuzhou SWAT probably will not go abroad. And in my opinion the Chinese slogan is better than 牺牲XX幸福XX, which has been said and heard for way too many times. I honestly have no idea. The best idiomatic phrase with a similar grammatical parallelism that I can think of is 捨己爲人, or less idiomatic, 捨己救人. I checked up some comments on it and it seems that the most possible original Chinese would be "辛苦我一個，幸福千萬家". There are also people saying that it may used to be "protect thy", which after auto-correct became "protect they". If this is the way how it came, then it might be the translation of “危難時刻 (suffered)，我們在您身邊(we protect thy)”. I think this guess is closer because the English translation appeared right under the Chinese slogan. Anyway, it must be from some translation tool…. Those who made the posters didn't think people would notice the English translation printed in much smaller font. They just wanted to make the posters look more international. Actually a lot of people commented that "It's good that at least they didn't use Pinyin, so forgive them for the messed-up English". Nowadays in China, even foodtrucks in small towns have Pinyin or "English translation" on their signboard. Indeed, Pinyin is the alternative choice if the owner doesn't know English but still wants his/her shop to look international, fashionable, or attractive. I can't figure out the original Chinese for the "Suffered We Protect They." If we read it backwards, which will be "They Protect We Suffered," this sentence will make more sense. Thank you for the hilarious poster! "Suffered We Protect They" might be just a wrong translation of "危難時刻, 我們在您身邊." I feel that the translator attempted to make it more slogan-like at the cost of grammar. I even suspect that the translator tried to come up with a slogan also with initials "S W A T" but unfortunately failed. Anyway, it's an embarrassing mistake. If I really have to make sense of it, "Suffer We, Protect They" would read like "We (the police) sacrifice for the sake of protecting you (people)." The propaganda I often hear as I grew up was "人民警察" should sacrifice (犧牲) for "人民" when necessary. But I think whoever made the poster simply wanted to have an English slogan for "危難時刻，我們在您身邊." I'm not sure if this would have a real impact on the foreign population in Liuzhou, or if the police are required to put English on their propaganda (perhaps as a proof of a "globalized" city). My idea is completely speculative though…. I thought it may come from Chinese that "有困难找警察" (if you meet troubles, please ask the police for help). I thought "we" in this slogan referred to the police, "they" referred to the people who is in trouble. This slogan may mean "we will protect you with all our effort" (危难时刻 我们在您身边 At the risky second, we are by your side). Note the honorific nín 您 for "you(r)". 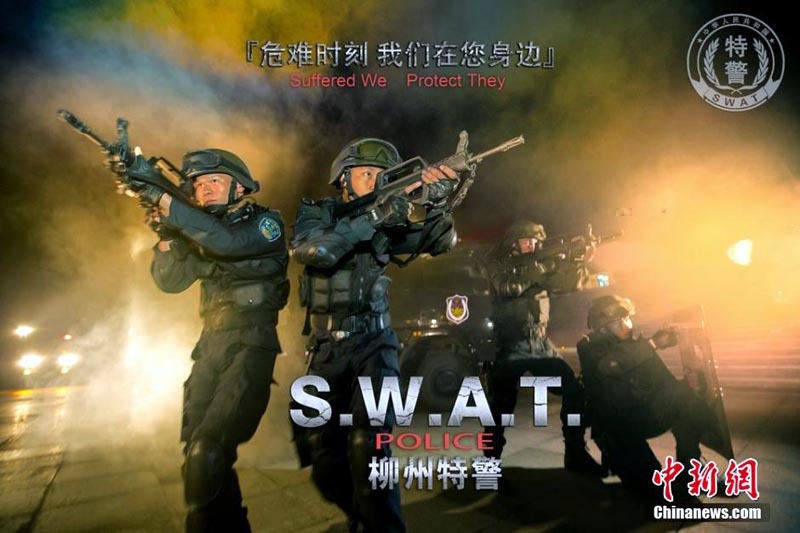 The acronym of "Suffered We Protect They" was probably as close to "SWAT" as the Liuzhou propagandists could come up with and still have a meaningful slogan for the squad. After all, "P" looks almost like "A" (perpendicular instead of tilted and lacking a short leg on the bottom right), but if I were there I would have suggested "Aide" or "Assist" instead of "Protect". BTW, a lot of the internet traffic (especially on Twitter [which is supposed to be outlawed in China]) on "Suffered We Protect They" repeated the trenchant comment of Fang Zhouzi (famous for exposing fake science in China) that China's tèjǐng 特警 ("special police", i.e., SWAT) are knockoffs of American SWAT, with the implication that naturally the English part of their propaganda is going to be of knockoff quality. In that vein, if you want to get an idea of where the Liuzhou police propaganda unit got its inspiration for the photographs on their posters, take a peek here. Is it possible that this is an attempt to come up with an equivalent to (or at least Chinglishize) the "Protect and Serve" slogan of many U.S. police forces? Interesting that one student mentions pinyin being used because it is thought to make things appear more fashionable. If pinyin is starting to take on that dimension, maybe it's more of a threat to characters than I'd thought. "Mr. Chambers, don't get on that ship! The rest of the book To Serve Man, it's… it's a cookbook!" The fourth poster is the most puzzling of all. Chinese police use crossbows? I'm just thinking about if the police meant to have "protect thee" instead of "protect they" (suggestion "protect" in #4), what would the Chinese translation be… since "you", rather than "thou/thy/thee/thine", was used as pronoun in polite form (as the case of 您) in Early Modern English, I was wondering if the archaic word ever chanced to be a polite address? I loved that one too, including the fact that they're wearing frogman suits and in the water up to the chest. "I even suspect that the translator tried to come up with a slogan also with initials "S W A T" but unfortunately failed." LOL loved this! Sounds like the most probable explanation to me. English acronyms are so trendy. However, I doubt anyone who came up with this slogan had "thee/thy" in mind… I also don't think any dictionary (paperback or online) would give "thee/thy" for 您. In reviewing the images, I wondered how many Chinese would know what S.W.A.T. means and if there was any reason it was featured so prominently. There is likely some exposure to the term through movies, but perhaps some people would see a pinyin acronym in their mind? 使我愛他 as an example, considering the nature of the images. I am the original blogger concerned. "I wondered how many Chinese would know what S.W.A.T. means." They may not know what the initials actually stand for, but they certainly get the concept. Heavy duty cops. In 20 years in China, I have never met any English speakers who knew "thee, thy, thine" other than a very few postgraduate literature students. I don't see the point of the discussion. It was a lousy translation and that is all there is to it. What the Chinese means and tries to convey is this: We are by your side at the time of crisis.